Looking for an inexpensive medium for a wide variety of craft projects? Bring out the tissue paper! These sheets of thin paper come in a variety of colors and designs. The paper cuts easily and glues quickly. Best of all, tissue paper can be found for a low cost at any craft or discount store. Now that’s a craft director’s delight! Give children a piece of construction paper cut in half, about 4” by 12”. Roll the paper lengthwise into a tube and tape edges together. Younger children may need an adult to hold the tube as they tape. Select a tissue paper butterfly and decorate it with stickers, markers, glitter, etc. If possible, get a small photo of each child and glue their face on the head of the butterfly. If a picture isn’t available, children can simply draw a face. Cut two strips of tissue paper about 2” by 4”. Wrap paper around a pencil to make curly antenna. Glue antenna to top of butterfly head. Now glue center of butterfly body on to paper tube. Let dry and you have a fluttery butterfly wand. sing scrap construction paper, trace around each child’s hand. Let them cut out their hand. On a large sheet of construction paper, glue the palm of the paper hand in the lower left hand corner of the paper. Gently bend the four fingers and glue the fingertips to the construction paper, so it looks like a hand holding something. Glue two or three tissue paper flowers in the top right hand corner of the paper. (They can overlap) Help children use a green crayon or green construction paper to draw a stem from the flower tops to the paper hand. They’ve just made a three-dimensional flower bouquet! Show children how to roll down the edges of a small paper lunch bag. Use a hole-punch to punch two holes about 3” apart on each side of the bag. String two pieces of yarn or ribbon through the holes to make handles. Set out an assortment of tissue paper shapes so children can decorate their bags. Add sequins, stickers or other items to embellish the bag even more. Give children a container of diluted glue and a paintbrush. Spread the glue over the entire paper plate and cover with several pieces of the same color tissue paper. Following the pattern cut a “V” shape out of the paper plate to make a mouth. Use contrasting pieces of tissue paper to add designs on the fish. Follow the pattern, (or make up your own design) cut tissue paper fins, gills and a tail. 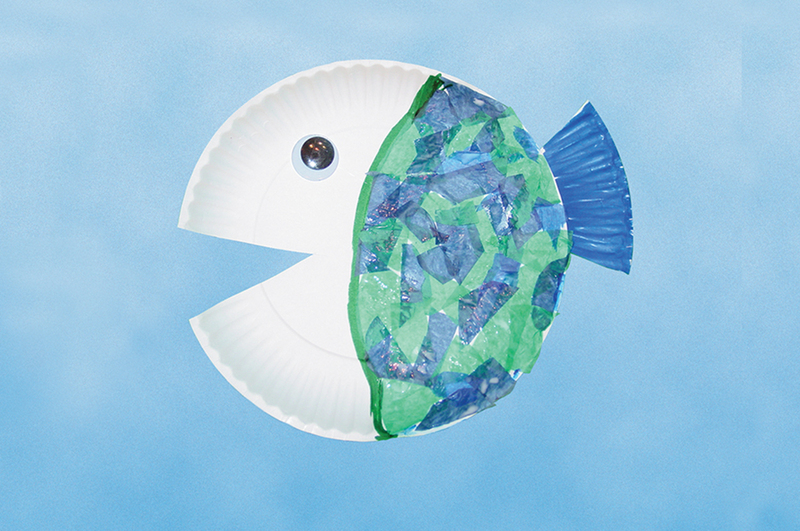 Glue on to the paper plate to make a fluttery fish. Ask children to sketch a tree trunk on a piece of construction paper. (You might do the sketch for very young children.) Let children wad up a piece of tissue paper so it’s the size of a walnut. Attach a spring-type clothespin to make a “dabber”. Holding on to the clothespin, dab the tissue paper in brown paint and then color in the tree trunk. Use the same technique for dabbing green paint for the top of the tree. While the paint is drying, children wad up pieces of red or pink tissue paper for pink blossoms or red apples. Collect an assortment of plastic spoons. Children use markers to draw a face on the bowl of the spoon. Glue two small strips of paper to the top of the spoon as antenna. Add wiggle eyes if you want. Decorate the tissue paper butterfly with markers or stickers. Spread glue down the center of the butterfly and attach to the spoon handle. Let dry. Ahead of time, cut pieces of yarn into 26-28” lengths. Tightly wrap a piece of tape around one end of the yard to make a “needle”. Show children how to cut plastic straws into pieces 2”-3” long. Cut scrap pieces of tissue paper in random shapes, about the size of a half dollar. Cut circles, triangles or free-form shapes. Use a small hole-punch to poke holes in the middle. Children can make a necklace by alternating stringing tissue and straws. Tie the ends shut when necklace is completed. Glue a tissue paper heart on a piece of construction paper. Spread glue along the entire perimeter of the heart. Help children place a piece of yarn on the glue, creating a yarn border on the heart. Let dry. Use a paintbrush to spread some diluted glue over the entire tissue paper heart. Cut or tear other pieces of tissue paper and paste inside the yarn outline to make a colorful mosaic heart. Let dry. Paint both sides of a paper plate. After the paint dries, fold it in half. Wad up several pieces of the same colored tissue paper to form the “oyster” Glue tissue paper inside the paper plate. Add wiggle eyes, buttons or wadded up tissue paper to make the oyster’s eyes. Spread decoupage solution over the bottom of a regular sized paper plate. (You can also use a diluted glue solution.) Have children layer scrap pieces of tissue paper over the plate. Let dry. Cut a slit halfway through the plate. Overlap the edges to form a cone shape. Cut off any excess cardboard. Staple the ends together. Add sequins or glitter. Cut strips of tissue paper and attach to top of the hat. Punch two holes on opposite ends of the hat and attach 12” pieces of ribbon or yarn. Now children can wear their hats to the next party!